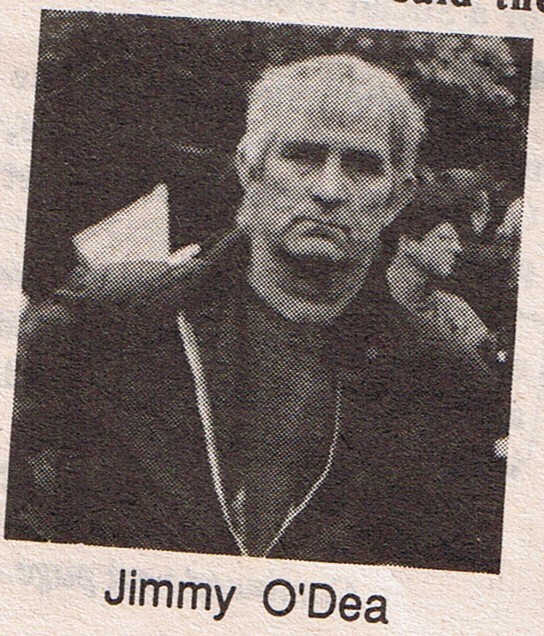 Jimmy O'Dea came to NZ from Ireland in the 1950s. He worked at Manapouri where was a union delegate. O'Dea learned his socialist politics in NZ and went on to join the Communist Party. In June 1971, O'Dea was Secretary of the Irish Connelly Association in Auckland. According to Truth, O'Dea marched in Auckland in support of the Irish Republican Army. "Of course we send them funds for arms. What else?" " He added "We think the only way to get united Ireland is by violence... "
Asked about the bloodshed in recent riots in Northern Ireland, O'Dea said "So what? A few people on both sides are killed., but what is this compared to the thousands who die through starvation over the years? You've got to put these things in perspective. The cause justifies the casualties." In 1975, O'Dea was involved in the Maori Land March and in 1978 played a leading role in organising the Bastion Point occupation. In the early '80s, O'Dea was was a supporter of H Block/Armagh in Auckland. In recent years he has been active in the Auckland branch of Socialist Worker, as have his sons, Kevin and Pat. Jimmy is a great bloke. I admire him and his efforts. Oi'm sure ya couldna foind a luvlier feller. Some British Army widows and orphans from the '70s might have a different view though. Indeed there are casualties on both sides in war, duh! There is nothing 'right' about the British presence in Ireland or for the Brits to continue to stay. The armed resistance by Irish men and women was a last resort and there was NO alternative. Fortunately that is changing in recent times and no more Irish blood will spill to send the British regime home. Where have I heard that before. I've got no problem with Irish independence, or even a United Ireland. I've got a big problem with a united Socialist ireland, which is what Sinn Fein/IRA,IRSP/INLA,CIRA etc etc actually wants. The big battle in Ireland is not Catholic vs Protestant-its freedom vs socialism. Guess which side the Republican leadership is on? Ok I understand. So what 'freedom' exactly is at risk with socialism then?